Dogs are so popular these days that there are lots of people who would like to create a career in dogs for themselves. They love dogs, they enjoy spending time with them, and they feel they have something positive to offer to both people and dogs by working with animals. Fortunately there are many dog-related careers available to people. Here are five good ways to make money and earn a living working with dogs. As a job, dog walking has become very much in demand in the past few years, particularly in larger cities with many apartment dwellers. People who live in apartments or in homes without sizable backyards, and who work during the day, are often in need of a good dog walker for their dogs. A dog walker will come by the home and take the dog out for a good walk, usually while the owner is at work. Many dog walkers will walk the dog for about an hour. For some dog walkers more vigorous exercise is involved, such as jogging. The good thing about dog walking for the dog walker is that he can walk multiple dogs at one time and have several clients per hour which improves his income. You can become a dog walker anywhere that there is a demand for such a service, though dog walkers are usually found in urban areas. 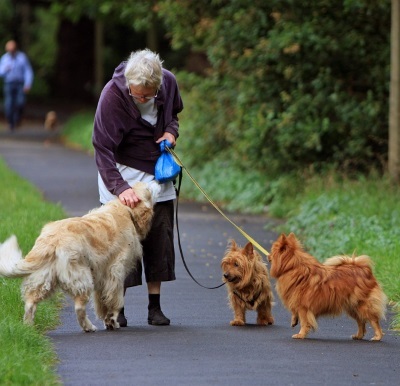 You could also walk dogs for the elderly or the disabled in smaller towns or rural areas. If you decide to become a dog walker it's a good idea to get some insurance and consider becoming bonded since you will be responsible for other people's pets. Decide how many hours per day or week you want to devote to the work. You can be flexible if it's a part-time job, but you must be reliable. Keep good financial records and have a written contract with your clients. It's a good idea to have extra collars and leashes with you when you walk dogs in case one breaks. Always pay close attention to the dogs and know where to take them for veterinary help. Like dog walking, pet sitting has become very popular. Many people prefer to hire a good pet sitter rather than take their dogs to a boarding kennel. A pet sitter can come to someone's home and take care of the dogs without causing them the stress and upset of sending them to a strange kennel with unknown dogs. In order to become a pet sitter you should do many of the same things discussed for becoming a dog walker: get insurance and become bonded. You will be in your clients' homes and you don't want to be blamed if anything should be missing or broken when they return home. Your insurance and bonding will cover you in case of any accidents. You should also keep good financial records and have a written contract with each client that details your services. Make sure you have contact information for your clients when they are out of town and that you have contact information for their vet. You should also know about any medications or special foods their dogs get. It's a good idea to visit with the clients and their dogs, in their home before they leave so you have a chance to meet the dogs and assess them. It also gives the dogs a chance to get to know you a little. As with dog walking, a pet sitter is able to have multiple clients at any one time. It's usually only necessary to spend an hour or so with each client dog or dogs to handle feeding, play time and to make sure the dogs are all right. You may wish to visit twice a day in some cases depending on feeding schedules. These are things to work out with your clients.